In one of our previous tutorial, we have learned how to download videos online from youtube, facebook and other websites in your computer without installing any software. In this article we will cover how to download videos in your mobile phone with a free video downloader app. So if you like to download videos into your mobile phone from youtube, facebook and other wbeistes with a free mobile video downloader app, there are number of applications available for this purpose. One of among them is ‘SnapTube’. 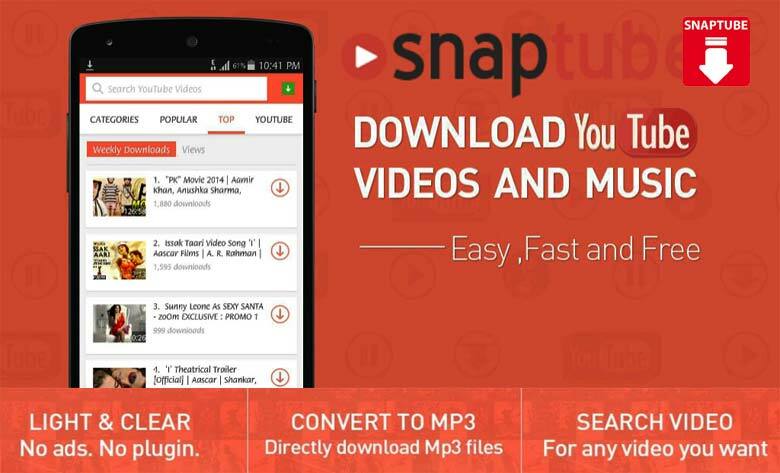 Using this application you can download videos from more than 30 websites including Youtube and Facebook directly into your mobile phone. If you have a link of a video, you can download video directly from the link. But there is also arrangement if you want to first and search and then download a video. Means you can first do searching by entering a keyword and then download a video from the search result. During downloading of a video, you can choose a quality of the video of your choice. If a video is available in hd quality, you can download it at 1080, and if you want you can only download audio/music of that video in mp3 format as well. Means there is a facility available in this app that you can download a video of your choice both in quality and format.